Guest Contributor August 8, 2018 4 Comments on World Masters vets show how to play, and how to party! Jill Campion was a champion in Charlottesville … with two new hips! Serena Williams received huge praise for her achievements in June at Wimbledon. Serena not only competed at the 2018 Championships, within twelve months of delivering her first child, but actually reached the final. 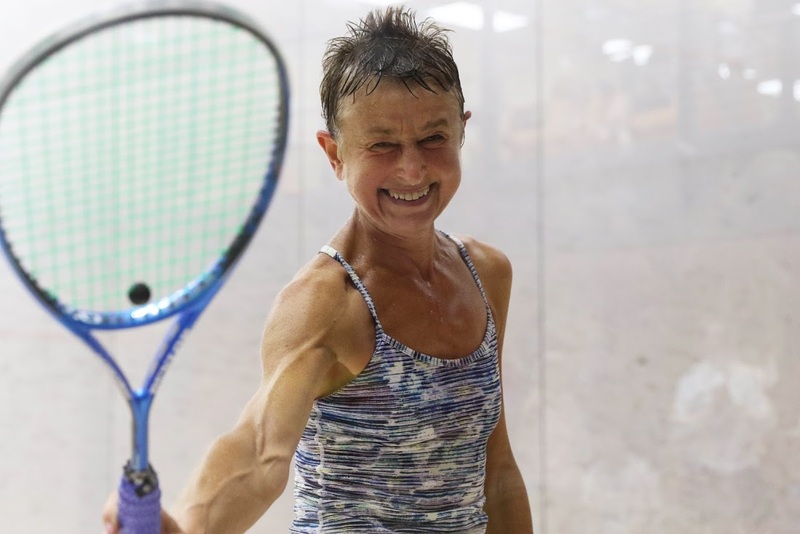 The biennial 2018 World Masters Squash Championships, which ran from July 29 to August 5, included 755 participants aged from 35 to over 80, from 59 nations. Squash is more brutal physically than tennis, and the Worlds represent the highest levels of the sport. Nevertheless, most if not all the contestants would have had to overcome physical challenges at least equal to Serena’s. Yes, you have to get up several times a night with a newborn baby, but so you do as a 75-year-old man. Yes, Serena had to overcome a pulled pectoral muscle from Paris, but you couldn’t find many tissues in an anatomy textbook that hadn’t healed, or were in the process of healing, in one or other of the players in Charlottesville. A great example was set by Pat Millman. 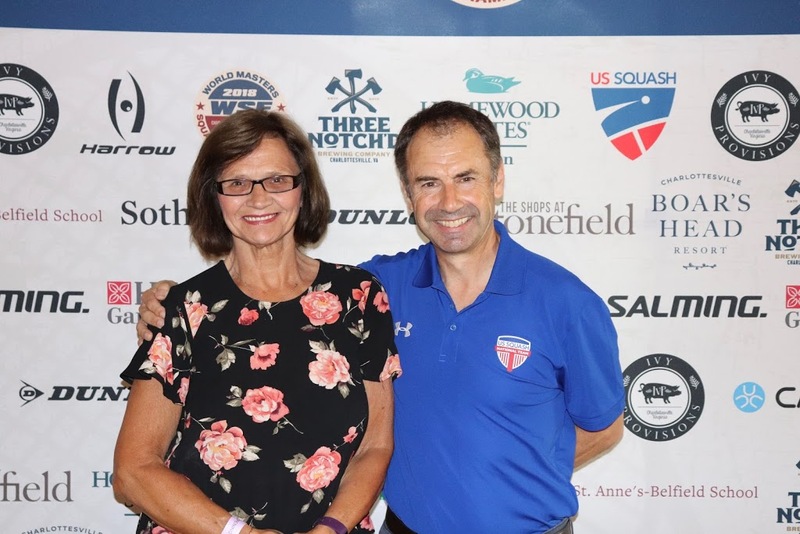 Pat is wife of the current President of US Masters Squash, Richard Millman, who acted as a most gracious host throughout the tournament. Pat played splendidly in the championships just three and a half months after a total hip replacement (THR). Many ordinary folk wouldn’t even have discarded their sticks at that stage following such a serious operation. Modesty prevented THR scars from being displayed on owners’ hips, but there were plenty of the 20-centimetre long, vertical white TKR lines on view, running down the front of formerly damaged knees. The surgeons don’t approve but the players just get on with playing after a TKR, no longer held back by effusion in the affected joint. Pat should be encouraged by the experience of Jill Campion, winner of the Women’s over-60 competition, gliding around on not just one but two artificial hips. The McArthur Squash Centre at the Boar’s Head Resort in Charlottesville, Virginia, provided a setting that will surely never be bettered for the World Masters Championships (although, with 25 courts, the Hasta La Vista Club in Poland, venue for the 2020 event, may have something to say about that). The organisation of the tournament matched the setting. So did the quality of the squash. You could go from a men’s over-35 final, featuring the physical phenomena of Laurens Jan Anjema from the Netherlands and Botswana’s Alister Walker, both recently on the full PSA Tour, to the over-80s, where England’s indefatigable Lance Kinder displayed astonishing mobility to prevail over the USA’s almost indefatigable Ed Burlingame. Their wives Jackie and Perdita, totalling well over 100 years of squash widowhood between them, were looking anxiously on. During practice before the competition started, you might have been surprised at the movement of a particular one of the players. Surely he can’t be over 35? I hope he brought his passport anyway, to verify his age. Well no! That was Diego Elias, recent world junior champion, currently ranked the 11th best player in the world. Diego was fine-tuning the play of his 45-year-old dad José, who eventually lost to the supersonic second seed, Zuko Kubukele, from South Africa, in a tough three-game quarter-final. If I’d been José I’d have just become depressed practising with Diego. The 2018 World Masters consisted of more than 5,000 matches. Gems were to be found all the way through the week. Number one for me was an unheralded semi in the ‘Second Consolation Plate’, for second round losers, between the USA’s Tim Wyant and England’s Mick Biggs. These two superb athletes spent 50 minutes sending each other at unimaginable speeds to the four corners of the court, leaving you gasping at both the precision of their shots and the quality of their pick-ups. Towards the end, Tim’s grunts would have done credit on the ATP tour. And, in a sport where two fast moving players frequently have to contest the same bit of space, there wasn’t a single request for a let, not one. 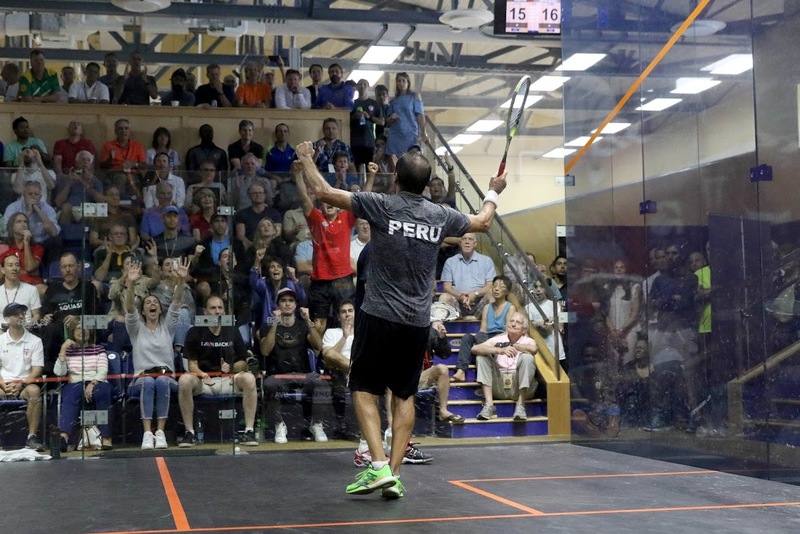 The recent PSA pro from Egypt, now coaching in the USA, who contested a match on finals day, should have taken a lesson from that game… and been ashamed. A friendly ‘Nations Cup’ competition is held for the most successful team pro rata at the World Masters, with a second version for nations with fewer than ten competitors (cue frustration among the twelve Scots, many of whom had played in their victorious second nations performance in 2016 in Johannesburg). England won the main team cup, helped by a hilarious WhatsApp group that ensured maximum support at every match, in spite of the spread-out layout of the huge McArthur Squash Centre. WhatsApp also enabled the England team to appreciate, at least vicariously, the splendid stamina of some of their fellow players, not least Captain Ian Bradburn, at and after the social events, down town. Strictly speaking, for 755 ‘elite athletes’, there was no opportunity for letting the hair down (ignoring the fact that the chemotherapy look was as much favoured among the men as the current trend for beards). There was no opportunity to pack your kit away early. If you lost in the Main Draw, you went into the Consolation competition. Second round losers? You still had the ‘Classic Plate’. Then there were the ‘Second Consolation’ and the ‘Second Consolation Plate’ draws. No rest yet, somehow you could get into two further draws, ‘Plate One’ and ‘Plate Two’. And, to overcome the disappointment of a losing semi-final, when surely you’d reached beyond all the plates, there was the third/fourth place play off and the chance of getting on the podium for a bronze medal. With competition that serious and protracted, non-squash players would have been surprised at the huge attendance at the social event. First there was the Meet and Greet Welcome Reception, where you first encountered the ‘Three Wall Boast Pale Ale’, a genuinely excellent beer (someone told me) specially brewed for the tournament by the Three Notch’d Brewing Company, one of the tournament sponsors. This event took place the day before the formal Opening Ceremony. 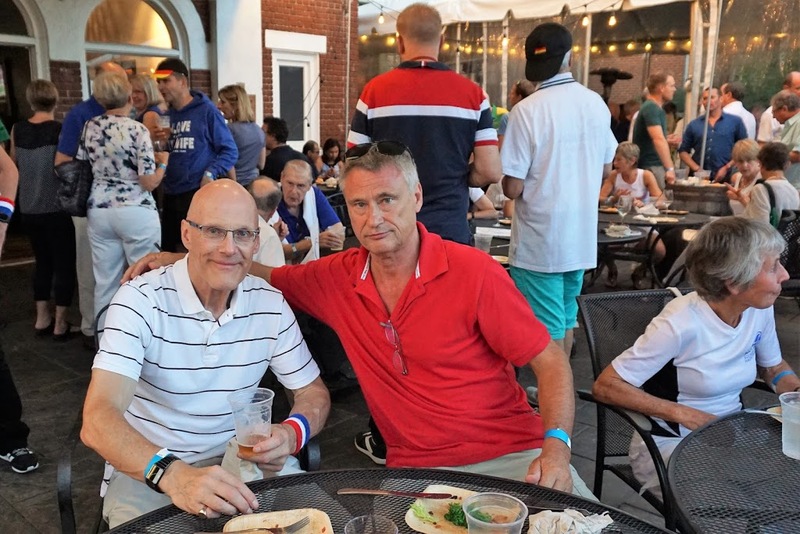 Yet another evening was occupied by the US Squash reception, and another, the BBQ Cook-Out. The Closing Ceremony, as well organised as the rest of the tournament, was bittersweet: hundreds of tired and happy folk saying farewell, about to take on their next physical challenge, jet lag. Still, they had the prospect of doing it all again in Wroclaw, Poland, in 2020. Whether Serena will have just completed another Wimbledon then, or another baby, or both, is not certain, but most of those from Charlottesville will be in Wroclaw, with or without new joints, but still with fitness and athleticism that would astonish normal people. Oh, and we even had a wedding during the tournament as England’s court repair expert Tony Gay married his partner Reka Burmeister from Hungary, who took the bronze medal in the women’s over-35 competition. We are delighted to share some pictures below. COMMENT: Any readers who played in Charlottesville are welcome to comment or share their experiences below. Absolutely perfect article. It catches the spirit of Charlottesville and the wonderful atmosphere that existed. Those of us who competed and may not have won medals, came away winners for just being there. Thank you for writing such a fine story. Such a great summary of a truly magnificent event, Aubrey. I so enjoyed meeting you and – if I can find a way – will upload the pic I took of the top 4 70+ men.. an inspiration to all! You are the best, Aubrey. Great to see you, as always. Look forward to seeing you again before too long (maybe in England again next summer). Thanks for your effort to put this together. I am sure many, many appreciate it.